Your doctor may prescribe a nuclear stress test or a MUGA scan in order to evaluate heart failure. When a stress test is combined with the use of a radioactive isotope (usually thallium and/or sestamibi) injected into a vein, it is called a nuclear stress test, myocardial perfusion scan, or SPECT scan. Your cardiologist will begin by taking a thorough medical history, discussing your symptoms, and conducting an extensive physical examination. Using a stethoscope, your cardiologist will listen for abnormal sounds (such as murmurs) that reveal problems with your heart’s function. A stethoscope will also allow the doctor to hear crackling sounds (called rales) that indicate fluid in the lungs). The cardiologist will check your neck for distended neck veins, feel your abdomen for signs of fluid retention and liver enlargement, evaluate your skin color, take your blood pressure, and check your pulse for a rapid or irregular heart rate. Blood and urine tests will likely be ordered. Some tests will enable your doctor to view and measure your heart’s shape, size, function, and capacity to respond to stress and exercise. The most common tests you are likely to have during the evaluation are discussed below. These tests are noninvasive, which means that nothing punctures your skin. The metabolic stress test, also called a cardiopulmonary exercise test, is done on a treadmill or bicycle. This test is used to measure your functional capacity, and how well you utilize oxygen during exercise. During the test, you will wear nose clips so that only mouth breathing is possible. A mouthpiece will measure how much oxygen you inhale and how much carbon dioxide you exhale. Your peak oxygen consumption will be calculated and compared with what is normal for someone of your age, size, and physique. This provides an objective measure of functional impairment. 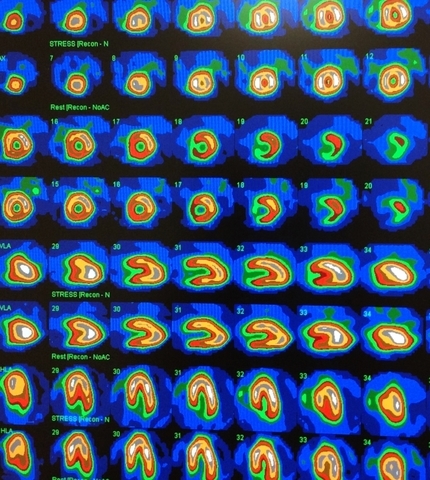 When a stress test is combined with the use of a radioactive isotope (usually thallium and/or sestamibi) injected into a vein, it is called a nuclear stress test, myocardial perfusion scan, or SPECT scan. SPECT stands for single-photon emission computed tomography—“single-photon,” because the radioisotopes emit only a single type of radiation (gamma rays). A special camera that sees only gamma rays is used to collect the gamma rays that a computer uses to construct an image—hence, the test is “computed.” Tomography is a method of reconstructing images in sections or planes. This enables a physician to look at a specific section of the heart to see how much blood it is receiving. 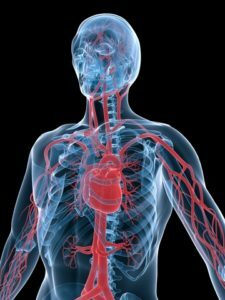 When the isotope is injected, the blood carries it to the heart, where it accumulates in areas with adequate blood flow. If a coronary artery is blocked, the isotope can’t get through. The test is usually performed when your heart is at rest and again after exercise. In larger individuals, sestamibi may work better than thallium. In some centers, thallium and sestamibi are combined for dual-isotope SPECT imaging. A variation of the radionuclide test is the multiple-gated acquisition (MUGA) scan, which captures the heart in motion. A small amount of thallium or technetium is injected into a vein, and as the isotope flows through the heart, the size and shape of the ventricles and their pumping ability can be seen. This test helps assess how well the heart contracts, and measures the ejection fraction of both the left and right ventricles. The test may be done at rest or while exercising. blood pressure, cardiopulmonary, coronary, echocardiogram, exercise, heart failure, metabolic stress test, muga scan, nuclear stress test, radiation, single photon emission computed tomography, skin, spect scan, stress, stress test.